It is often useful to have an auxiliary plate that fits on the surface of the rotary table. There are two main possibilities. The plate is round or the plate is rectangular. In either case, the most obvious reason for doing this is because the size of the rotary table available is not large enough for the job in hand. 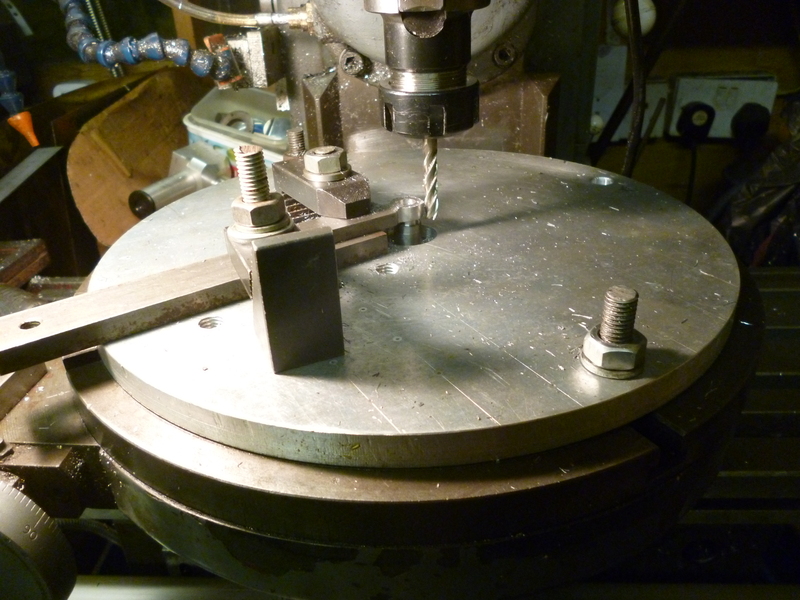 A second reason is that the way the T-slots are laid out on the rotary table are not as convenient as they might be. A general purpose auxiliary plate might simple be a round shape that fits onto the rotary table so that it is coaxial with it. But in many cases it is not necessary to do this as the rotary table only needs to be “wider” for part of the whole circle. 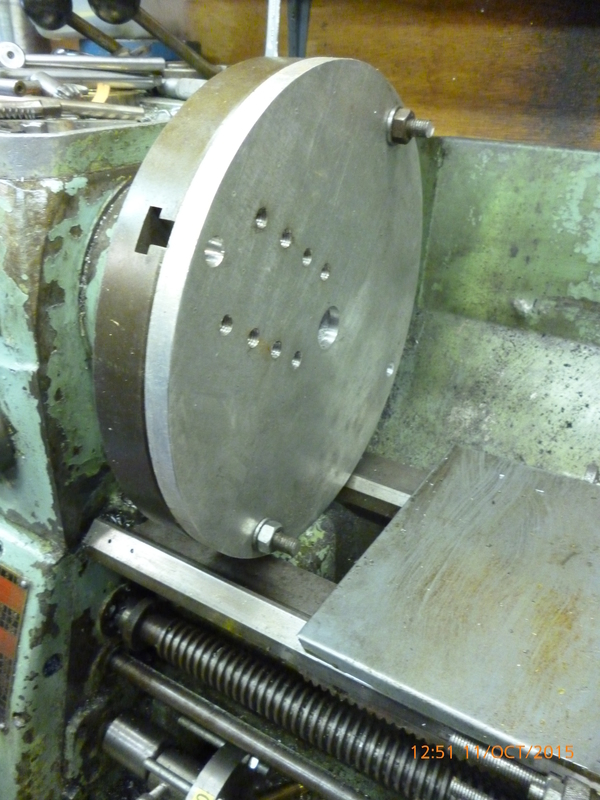 A small rotary table can be increased in size by fitting it with a round, auxiliary table. Most small rotary tables are fitted with four T-slots radiating from the center at right angles to each other. Near the center the T-slots are too close together, on the other hand, as the rotary table gets bigger the distance between the T-slots at the edge of the table get very wide apart. This can be a problem. On very large rotary tables, to get round this, the T-slots are often simple just parallel to each other. With an auxiliary plate the workholding arrangements can be whatever suits the user. 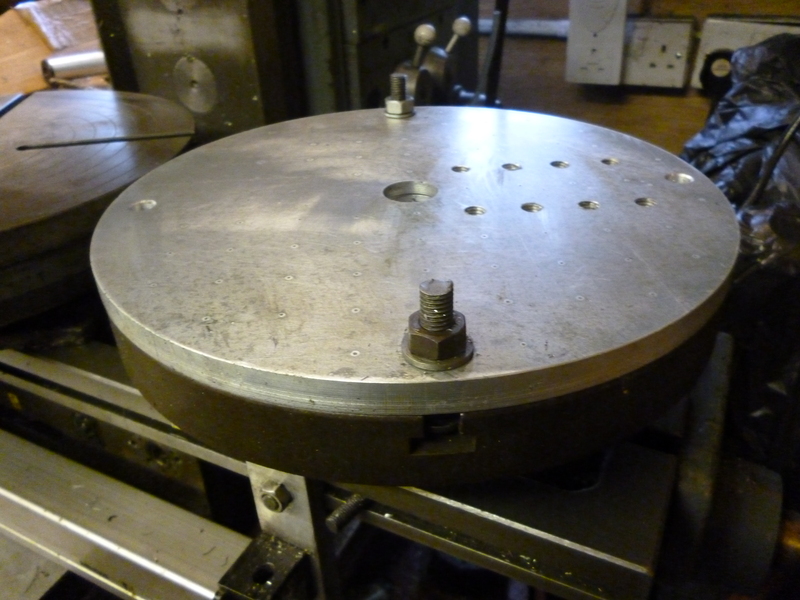 In this case a large round plate was made to fit a large rotary table. It has holes round its edge so it can be bolted onto the rotary table. It has a hole in the middle so there is good access to the hole in the rotary table. The fitting of this plate on the rotary table is not critical. When the plate is fitted all alignment is done using the hole in the rotary table. The plate was marked out for holes on 25mm. These were marked with a punch but then sanded flat. Where holes were needed 10mm holes were drilled and tapped. Holes were drilled for a particular type of job – end rounding. The holes actually form two rows that are parallel. These make it possible not only to clamp the workpiece but there is space to fit stops so the workpiece is positioned automatically. All the clamping etc is done by screwing pieces of studding in the holes. Even so, this type of job only uses about a quarter of the space available. It might be noticed that the plate is slightly smaller in diameter than the rotary table. This was done so that it could be fitted to the face plate on the lathe. The reasons for doing this are exactly the same as for using it on the rotary table – the make the surface larger and/or to provide a better arrangement for holding a workpiece.